Application Notes: Detects a band of ~76kDa by Western blot. Scientific Background: Transferrin is a serum glycoprotein involved in iron transport. Transferrin exists in two forms, the iron-free Apotransferrin, which binds two Fe3+ ions to generate Ferrotransferrin. Apotransferrin remains tightly bound to its receptor until the complex is recycled to the cell surface, where Apotransferrin is released into the extracellular space to recruit more Fe3+ ions. 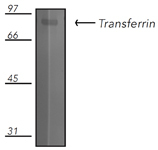 Western blot analysis of rat apotransferrin protein probed with transferrin pAb.